I had a fabulous day in the vegetable garden. It’s taken a while this year but I am finally able to do some harvesting rather than just weeding! All day long I’ve been bringing bits and buckets of edible bounty into my kitchen. 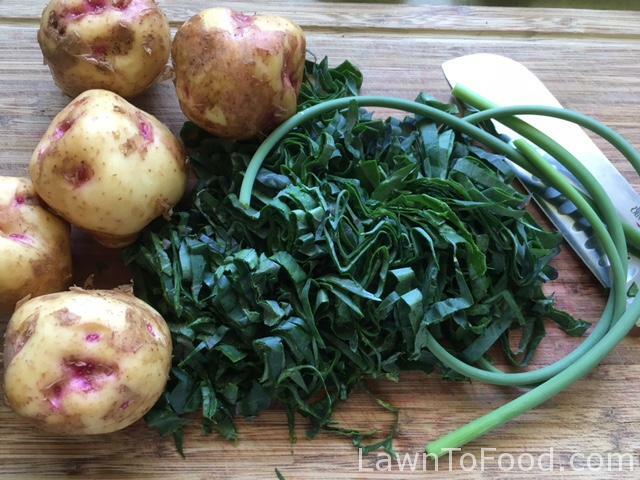 As suppertime is approaching, I decided to tackle the greens, garlic scapes and some new potatoes that were purchased from our local farm market, Siefferts. My greens basket consisted of bug torn Lacinato kale, some outer purple cabbage leaves that were crowding my onions, dill, yellow Swiss chard, curly kale and garlic scapes. 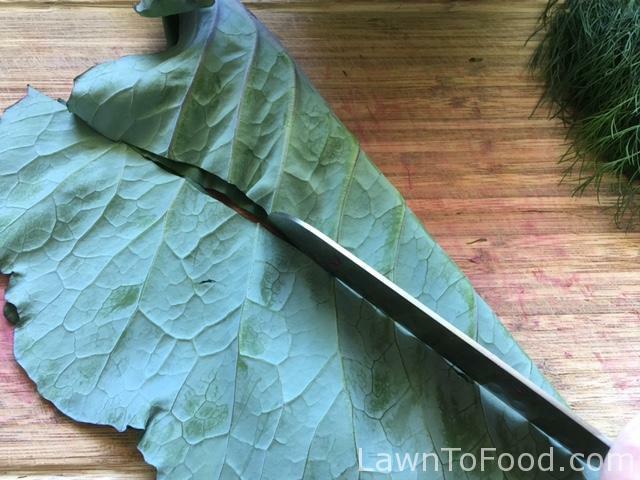 After rinsing all of the greens and herbs, I cut the purple cabbage leaves to remove the tough inner stalk. This is easy to do by folding the leave along the rib and cutting it out, in a triangle-shape, which removes the centre and other tough veins at the same time. Once the greens were cleaned and trimmed, I sliced them into ribbons. I added about three garlic scapes, which were chopped into tiny pieces. 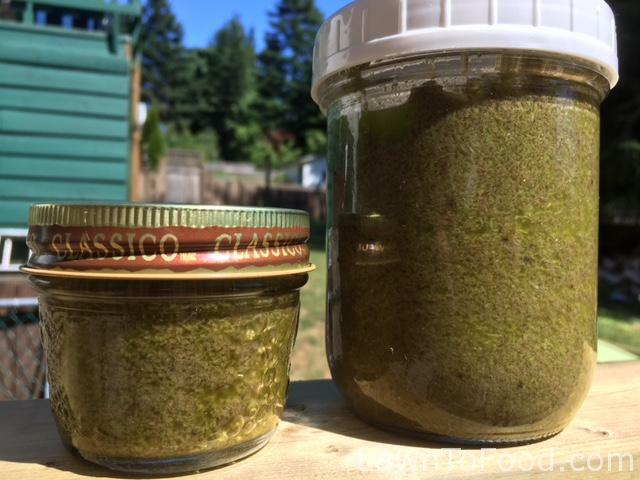 I diced some new Warba potatoes with their skins on to make my version of Potatoes & Kale. The scapes, the greens and the diced potatoes were all cooked in the same pot of water with a generous pinch of sea salt. While this was on the stove and coming to a boil, I made some garlic scape oil. 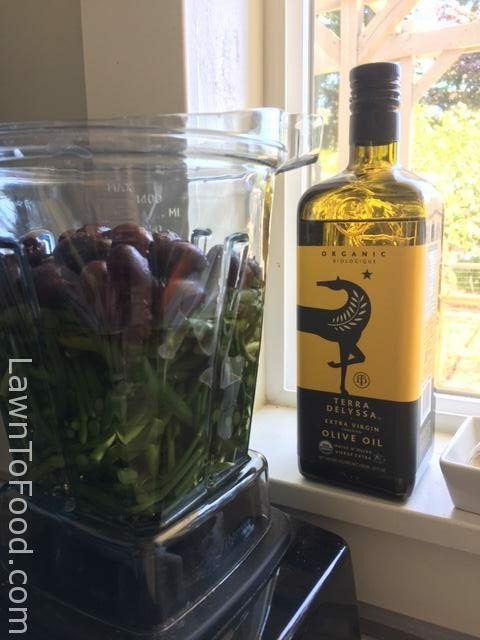 About 3 c of chopped garlic scapes were blended with 1/2c pitted olives and 2c of quality organic olive oil. 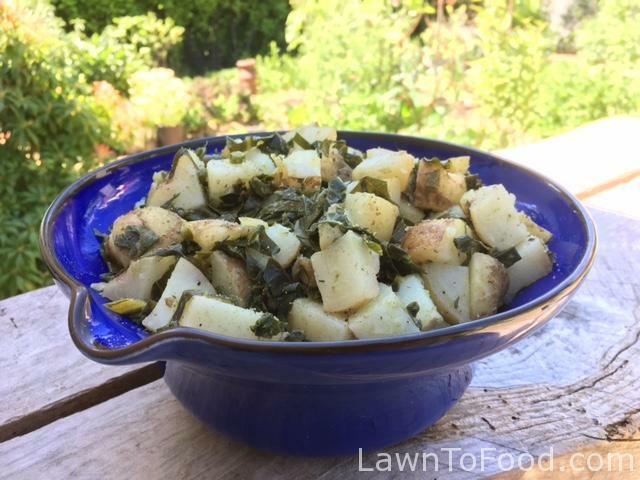 Once the new potatoes were cooked, I drained the pot and added chopped dill, freshly cracked pepper and two heaping tablespoons of the garlic-scape-olive-concoction. 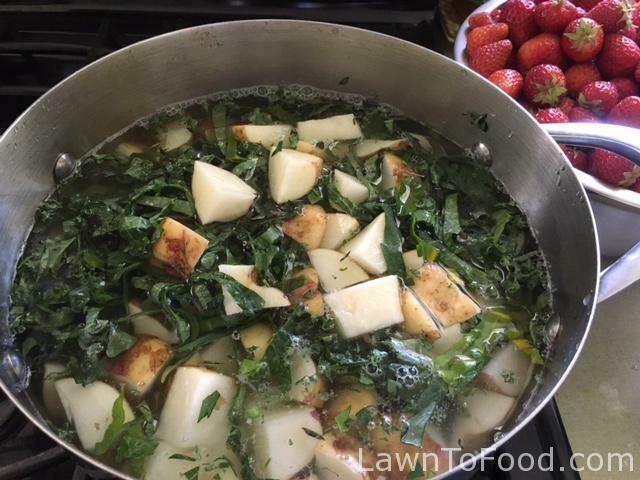 The warm potatoes and cooked greens soaked up all of the flavour of the seasoned garlic oil. It’s delicious! I enjoyed some hot this afternoon but this is also going to be great as a cold potato salad side dish tonight or tomorrow morning as bubble’n’squeak with some poached eggs. 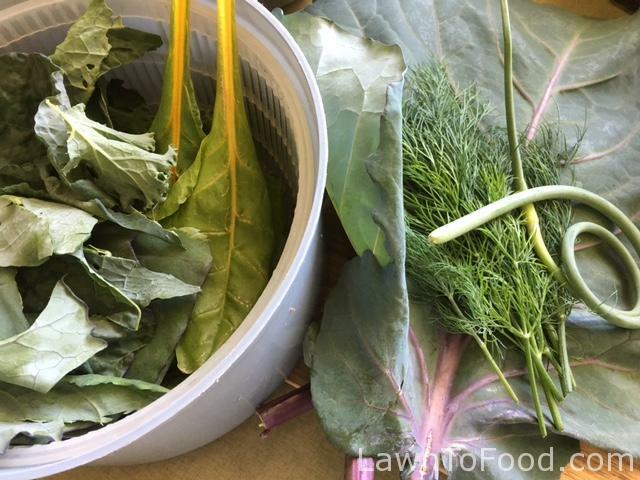 What are you going to create for supper with your garden’s bounty? Inspiring, you make it seem so easy and delicious. I’m motivated to give it a go. Thank you! I tried this, but I replaced the olives with some capers I had in the pantry, and you’re right! It was excellent. Even my local olive hater loved it. It’s maturing a bit in the fridge, but definitely going on some pasta in a few days. One thing I did notice though, is that you need to trim the heavier bits off the scapes, or it ends up a little fibrous.